I hereby claim tax free status. it’s an obvious statement, but i’ll make it anyway: this simple verse calls into question the “mass” mentality that dominates (and has dominated for centuries) the quest for understanding, truth, etc. it’s a reminder of how much security is sought in dogma. let the angels rejoice. we have found our church and all is well. that’s a photo of a real blow up church by the way. seems you can take your chapel anywhere. folks even get married in them. a plastic church full of hot air. what could be more symbolic. well (to respond to your last comment, Akbar), i’m not sure how to go about elaborating. there are many angles one could take. the simplest one for now seems to be to say that there is a difference between externally-provided direction and that which comes from a more intimate source. the solidity that happens when many people agree and adhere to a name (i’m thinking about churches, particularly in our country), and then fall over themselves defending that name, that label, always seems inauthentic. the principles which, in name, are said to inspire the church always seem to collapse under the weight of that edifice–the church, in other words, becomes more important than the principles. and while i agree that social interaction, fellowship, etc., is necessary to the practice of principles, it actually becomes untenable when spread across an impersonal mass. although we feel we participate in the constructing of dogmas, and ideology…it would be perhaps more proper to see us as attracted or repelled, as a result of internal interests. the development of personal consciousness helps us veer our social participation along its inertial path…helping us to stick more decisively to favored stages of institutional development. hmm. not quite sure how to interpret that. perhaps i am being too crass…i apologize..
i think i am beginning to see what you mean. but do you mean “fresh ideas” or new applications of old ideas? yeah, or like when you make a smoothie with bananas that have turned dark. If you are going to present a point by posting photos such as these, please be respectful enough to place some sort of narrative to them. After analyzing whatever you were trying to say, I can only assume that you are (yet again) making attacks against (suprise!) Christianity. Of course, I would not expect someone like you to do something so low. Diversity and respect of others are themes in your past posts. Why would you segment out this demographic? Wait! I know why! You pick and choose how ‘diversity’ suits/accomodates you. By doing so, is that really diversity? You can always feel free to disgaree with another group’s mantra, but please don’t be so limited. I dare you to treat Muslims and the Jewish the same as you have treated Christians lately. I suspect you won’t, though. Doing so would make you ‘prejudiced,’ right? Just something to think about. I’m going to set my timer to see how quickly Ackbar responds to my post. For some reasons, he always seems to have his boxers in a bunch. If you are going to present a point by posting photos such as these, please be respectful enough to place some sort of narrative to them. After analyzing whatever you were trying to say, I can only assume that you are (yet again) making attacks against (surprise!) Christianity. Of course, I would not expect someone like you to do something so low. Diversity and respect of others are themes in your past posts. Why would you segment out this demographic? Wait! I know why! You pick and choose how ‘diversity’ suits/accommodates you. By doing so, is that really diversity? You can always feel free to disagree with another group’s mantra, but please don’t be so limited. I dare you to treat Muslims and the Jewish the same as you have treated Christians lately. I suspect you won’t, though. Doing so would make you ‘prejudiced,’ right? if you believe this post is in any way a criticism of christianity, please, by all means, make an argument for it. in the very post you admit that your interpretation is an assumption…and any armchair psychologist would point to your defensiveness and question whether or not you have unconscious conflicts that drive you to interpret this post as somehow threatening to the religious position you have taken, even though nothing in the post can be pointed to as negative. the second, more interesting theory, is that you have negative internal conflicts with your religious life, and that the juxtaposition of those conflicts with your long-standing desire to best globatron, caused a psychic compulsion to attack without thinking it through. Two things, before one claims wisdom they should always be humble enough to realize they know nothing. Second, Jesus hated religion, he believed in faith, religion is what you get when man attempts to take faith and institutionalize it. I am a Christian but not affliated with any church, why? Because man is flawed, imperfect and always will misread the will of God. Faith is a personal experience that is as unique to an individual as one’s own fingerprint. To organize this to the confines of a church and structured formality of religion does a diservice to Christ and all he tried to teach us. In any case I am not hear to preach, I would never be so bold as to say I have a church but I do however know who Christ and God is to me. He is the miracle of seeing my daughters faces when the first see the light of this earth, he is blessing of having a woman who chooses to love me in spite of all my many faults. He is divine gift of living in a land of freedom, opportunity and great abundance where so many live in adject poverity. There are so many things God is to me. So I really hope this did not get preachy and by no means am I saying my belief is for you or you should believe. All I would say is to quote Kirk “I like to think there always possibilities.” Be open to your possibility. this verse could be applied to any organized religion Buddy. 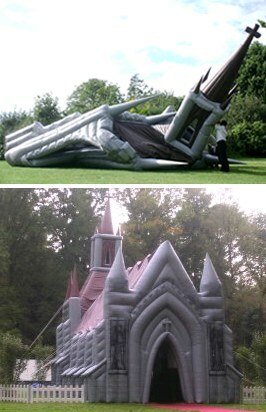 the blow up church photo could be a temple or mosque if they made them. akbar, your armchair psychology analysis is powerful and i’m pretty sure one of them is correct. which one is for Buddy to decide. Greg thanks for sharing man. I appreciate it and God is so many things to so many for sure. It’s amazing how anything organized seems to destroy that spiritual connection you have shared with us. It’s the spiritual in religion that churches, etc. seem to always destroy. Yeah Globa, I got to tell you the movie Dogma has to be one of my favorite of all time. It is so spot on with things including religion and faith and the absurdity that has become organized religion. I really miss the America where we had small town parrishes that truly were just committed to helping the community and providing whatever spiritual guidance when people asked. Now…..Now…..? Now it is about having 100 cable/satellite channels all dedicated to your religious doctrine or dominiation screaming your literature at us. Now it is not about spiritual guidance it is about seeing how many followers you can inspire to join your POV. Now it is about the overwhelmingly bloated infrastructure and influence that is the Catholic church, no offense to Catholics, but do we really need a damn city dedicated to the church? Now it is about everything that spirituality is supposed to be about. It is about religion and that does not lead one to faith. Somewhere we forgot the point of gathering to worship and honor was to also get in touch with ourselves, and our personal faith. When we abandon our personal relationship with our faith in the name of someone’s religion then we have truly done a crime unto ourselves and whatever Higher Power you have faith in. Whoo. Sorry all about the rant. This is something I really feel strongly about as I have had MANY bad experiences with churches. Had one tell me one of my two daughters was a demon spawn because her mother and I were not married. (Penacostle or one of the P dominiations I remember). That is the state of religion in this country and it is sad and it not what reflects spirituality in my opinion. Where did we lose sight of the message and purpose of faith? Anyway hope all are having a happy Friday. I’m going to make this short and sweet. Arguing on a blog is not something I do. Although I do feel as though someone needs to put you in your place. To be extremely blunt, Akbar, I think political correctness has blurred any common sense you have when putting up these posts. It seems as though you like to use really big words (which I understand by the way) so that you can possibly come off as more ‘intelligent’ or feel superior than others. My advice for you is to get to know the people you freely dispense criticisms to. Maybe you might learn something in the process. Cool idea, isn’t it? Learning…..
I’m out of here. I know my God is real. I think it’s funny you feel the need to bash a faith just because you disagree with it. It’s not surprising, though. It’s the trendy thing to do. Budddy, I wrote this post. If you had bothered to look you would have noticed. If you knew that and you are still attacking Akbar then this shows that you have an issue with Akbar not the post. If you had known the history of this thread that has gone from another comment then you would know that the use of this verse was because of that. It in no way was specific to any religion. You might want to ask before casting your judgment. Especially since I know you. And you say you don’t argue on blogs but that is ridiculous. You only come on here to argue and you always stir the pot on Facebook. And again, I would hope your two masters degrees would help you in reading them thar “big word”. Thanks for stopping by though. I wish you the best in Jax. Cast judgement? Not hardly. I have every right to disagree with you and everyone who posts. I also have the right ( or so I think) to state how I feel about a topic. I am very aware that you wrote this. Whether I like it or agree with with it is not up for debate at this time. If you want to discuss this in heated detail, then by all means I would have no problem with you contacting me. Ultimately, I don’t know what you are trying to say exactly. Only you know what you are trying to say. And you did say it’s not about Christianity? Right? Issues with Akbar? I don’t have the energy to have issues with Akbar. I don’t care to have issues with Akbar. I don’t even know him. Actually, I find Akbar to be a hoot. If you read your posts, Akbar goes after me with his convoluted points. I just simply defend myself. In conclusion, it shouldn’t surprise you that people get heated when it comes to sensitive topics, especially when it comes to politics and religion. Playing the victim card is just so…. I am very aware that you wrote this. Whether I like it or agree with it is not up for debate at this time. If you want to discuss this in heated detail, then by all means I would have no problem with you contacting me. talk about hot air. just because you call yourself a christian, buddy, doesn’t mean that whatever you decide to lay your hands on is “christian” (gasp!). did jesus call himself a christian? where does it say that in the bible? or matthew, mark, luke, john? where is that word written? Actually Logo if Jesus called himself Christian would that be like him talking about himself in the third person? Yo MAN Jesus Christ is the number one CHRISTIAN yo! Yeah man cause it’s in the name yo! Jesus CHRIST, yeah man like CHRISTIANS…get yall, you guys are following ME, THE CHRISTIAN, The Jesus CHRISTian. Ok now yall stop playin. I do not know buddy but it seems he is coming from a place of feeling his religion or belief system is under attack, Buddy if you really believe then what anyone else thinks does not matter. Ever. That is the beauty of faith, it is up to you decide whether to believe or not. Don’t worry about the opinion of others, if you believe then go for it. Globa, Akbar and no one here is attacking religion, (well I did in some of my posts) but that is because of what it has become. Anyway, the road to faith is paved with one’s own resolution in devotion. Amen Greg. I dig the visual as well. Definitely Buddy tell us about your faith if you so desire. I believe we are all here men of faith of some sort. There was no intention of attacking any one religion but to question organized religion. If we are five men gathered in the name of peace and love are we not men of Christ? Does that not make this a church? In the fear of somehow tainting or corrupting what I see as something constructive I would suggest instead of the label of church we consider ourselves a collective of inquistive individuals seeking higher enlightment. I simply cringe at the word church, maybe that is from some of my bad experiences. Then again there are those who I actually find rather inspiring like Joel Olsteen and he actually has the old dome in Houston I believe as his church. Holds like 30,000 for his message every week. He sermons are usually very well thought out and more about personal intergrity and honesty with a heavy emphasis on the spiritual relationship to God. He has actually said on numerous occassions that he is man and is flawed so to find our own way and not be lead blindly by another flawed man. Of all the publicly known speakers in this realm I actually have some respect and interest in his words. Happy Friday to all, Akbar I know you are probably working so I only have one thing to say. definitely. the word church is a stretch. far stretch, but was meant to be an illustration of what the true meaning of fellowship was meant to be. Jesus had some doozies didn’t he. intellectual depth can be measured…and although the measurements are not as easily quantifiable as the weight of stones…you can look into the heart of people sometimes…in fact, when somebody misreads a post, and the use of a quote as an attack and then goes on an emotional tirade, it would take Wittgenstein to find an argument to conclude anything but that the person had some sort of personal agenda at stake. the use of the quote was meant as honoring of the christian faith, in the widest possible interpretation of Jesus’ life. such interpretations require the kind of relationship with Christ that is personal and mystical. in other words, Globatron is a christ in my life, as is MLK and Gandhi and Thoreau…these are all christ figures, who put themselves through personal sacrifice for the betterment of their fellows. this is what that quote was about…and frankly, i don’t think you have the depth of insight to really understand that…that is your loss. i think greg will attest, that i am very willing to engage in a serious and thoughtful discussion with those, like him, who have shown a sincere interest in globatron…but to those who come on and put forward a thoughtless attack, i will not pretend that a serious criticism was put forward, when it was obvious that you used the post to launch a personal attack.